The new, streamlined Areas of Responsibility in the Arctic. For years now, the U.S. military’s responsibilities in the Arctic had been divided up amongst three geographic combatant commands: USNORTHCOM, USEUCOM, and USPACOM. The area of responsibility (AOR) for NORTHCOM, which was established by the 2002 Unified Command Plan following the 9/11 attacks, included all of North America. 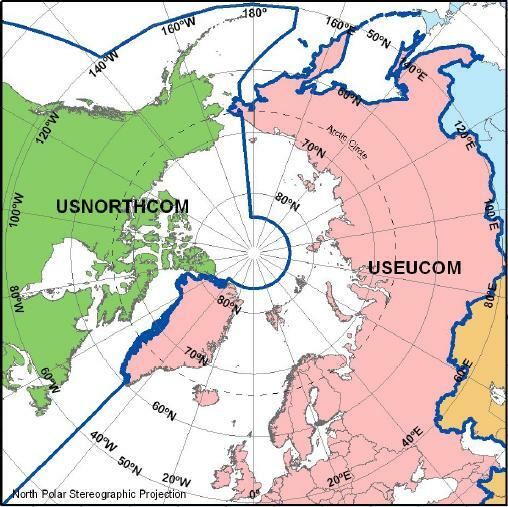 Alaska, however, though technically assigned to NORTHCOM, still had its command forces assigned to USPACOM. In the same year, EUCOM gained responsibility for Russia, Iceland, and Greenland in 2002. Thus, it has been difficult for the military to develop a vision for the Arctic with three different commands assuming responsibility over various parts of the region. The increased emphasis on the Arctic in the new UCP mirrors changes that have taken place in other countries’ militaries. In 2009, Norway moved its Operational Command to Reitan, outside Bødo in the extreme north of the country. Russia is developing a special Arctic forces unit to be based in Pechenga, near the border with Norway. While the U.S. won’t be headquartering any of its commands in Alaska soon, the fact that the Arctic is one of the primary changes in this year’s UCP speaks volumes of the region’s growing significance in the eyes of the Pentagon. We will see if NORTHCOM is up to the task in the next two years, before the next UCP is released.